A double-digit increase in revenue, improved operating leverage, and manufacturing cost savings helped drive profits up. Management says there's more where that came from. Environmentally friendly residential decking and high-end commercial railing manufacturer Trex Company Inc. (NYSE:TREX) announced third-quarter results on Oct. 29 after-hours, delivering another big, profitable quarter of growth. But, frankly, things got weird when the market opened for trading on the 30th. Mr. Market responded by sending Trex shares down as much as 12% at the open, only to see them eventually recover later in the day and actually finish after-hours trading up 3%. Stocks can be weird, dude. Seriously, this is an excellent example of how a short-term focus can burn you, since there's no predicting how the market will respond from one day to the next. But as long-term Trex investors have experienced, the strategy of buying great companies and then holding while they do the heavy lifting can pay off quite well. Let's take a closer look at Trex's third quarter, as well as management's comments about its prospects in the quarters ahead. Despite the company reporting great results and improvements across its operating segments, its shares are down 31% over the past two months as concerns over the housing market have investors selling in fear. Over the past couple of years, Trex has regularly delivered double-digit sales growth. But its earnings and cash flows have increased at a much higher rate. That proved to be the case in the third quarter as well. Sales were up 19% to $166 million, while earnings were up 47% to $0.50 per share. Sales of its core residential products, primarily Trex decking, continue to grow at a solid rate. Commercial products sales increased 12% in the quarter, and that was after the company took a $6 million charge to fund stocking expansions with key distributors to drive future growth. Adjusting for this one-time investment, residential sales were up 17%. On the earnings call, CEO Jim Cline pointed out that consolidated sales were up 23% when adjusted for the $6 million charge. TREX Gross Profit Margin (TTM) data by YCharts. There were three things that helped the company deliver earnings growth at more than double the rate sales increased. First, Trex continues to benefit from greater operating leverage. 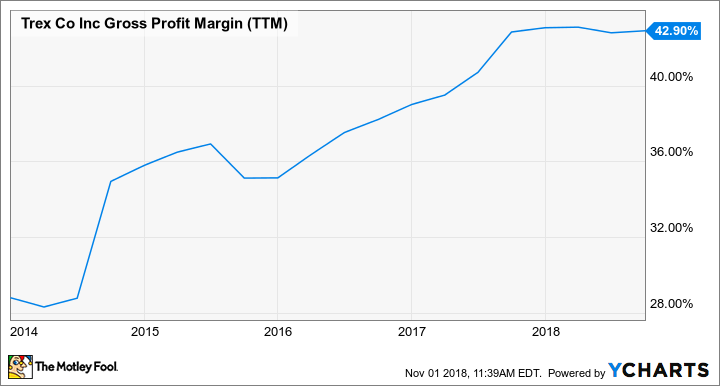 Trex said its gross margin in the quarter was 40.7%, but has continued to enjoy incremental margin -- margin on sales above and beyond last year's level -- between 45% and 50%. The company also continues to benefit from falling input costs, mainly used polyethylene film, a key ingredient in producing its decking, along with scrap wood shavings. Recycled poly prices have steadily fallen in recent years, primarily due to changes in Chinese policy on procuring scrap poly from outside its own borders. This has created a glut of domestic oversupply that, while not good for recyclers trying to offload the material, has paid dividends for Trex. Thirdly, Trex management has been rigorous in driving improvements in its own manufacturing, and its actions have steadily paid off. On the earnings call, CFO Bryan Fairbanks said that these investments in manufacturing efficiency were worth about one-third of the company's improvement in gross margin year over year. The acquisition of SC Products, which is now Trex's commercial products division, is also performing well. This division generated $19 million in sales last quarter, with 25.9% gross margin representing a 130 basis point improvement from the second quarter. This was its best quarter in both sales and profits in just over one year since being acquired, and Cline said that its gross margin improvement put its profitability "in line with the expectations we had for second half results." Management expects Trex commercial products to generate $59 million in sales for the full year, not a bad haul considering the company paid just over $71 million for it last summer. This business may not generate the same high gross margins as Trex's residential products, but with lower operating expense that leverages much of Trex's already existing back-office, this acquisition is well on its way to delivering meaningful long-term returns. The market is certainly concerned about Trex's ability to continue growing at recent rates. Since peaking on Sept. 10, its shares have fallen 31% at recent prices. And while I'll not fall into the trap of predicting it will only go up from here, I will say that its prospects are probably less tied to housing than the market seems to think. While a healthy housing market is important for Trex over the long-term -- it does rely on people owning homes and eventually replacing their old deck or adding a new Trex deck -- the general health of the economy and consumer spending is probably more important to its prospects. And on the earnings call, Cline said that the company's own channel checks are reporting double-digit growth in demand in recent months, while survey data also indicates strong consumer confidence. The $6 million Trex will invest in expanding stock across its retail sales channels is squarely aimed at taking advantage of this steady, strong demand, and is expected to start paying off during the second quarter of 2019, when next year's deck building season kicks off. That's not to say there won't be a surprise between now and then; economic conditions can change quickly and unexpectedly. But the big takeaway is that Trex management continues to invest in growing the business as well as taking steps to improve its manufacturing more efficient and profitable. As we have seen over the long term, there will be bumps in the road. But so long as the company continues to expand its market share while also keeping cost in check and improving its manufacturing operations, long-term investors should be rewarded.